In previous blog posts I introduced the definitions of the elements used in my research to find the most prescribed items for each BNF Chapter,as they have been understood I will now reveal my findings. Using Tableau Public I found out the top 10 most prescribed items in 2014 for several months and results were mostly the same across these months. I was particularly interested in the what would be the most prescribed medication under each BNF Chapter for those months. In this blog I will talk about my results for April 2014. The most prescribed item was Omeprazole Tablets 20mg as there were 2,002,522 items of this medication dispensed in April 2014.This is shown in Figure 1. Omeprazole tablets are used to treat symptoms caused by excess amounts of acid in the stomach such as stomach ulers, heartburn and indigestion, by reducing acid in the stomach.It can also be used to promote healing of erosion in the esophagitis, caused by stomach acid.This medication may have been dispensed in large amounts because there is a lack of enzymes in the food a lot of us eat today, such as white bread, pasta, cookies, cakes,cracker etc ,therefore the stomach produces an excessive amount of stomach acid to compensate, leading to acid indigestion. The most prescribed item was Simvastatin tablets 40mg at 1,829,256 items dispensed in April 2014. This medication is used to reduce levels of “bad” low-density lipoprotein cholesterol, while increasing levels of ‘good’ high- density cholesterol. However the second most prescribed medication under BNF Chapter 2 was Aspirin Dispersible tablets at 1,781,963 items. Aspirin Dispersible tablets are used for pain relief, reducing temperature and also act as an anti-inflammatory to reduce swelling and aspirin can be used to prevent formation of blood clots. It is argued that Simvastatin tablets were dispensed a lot because many doctors prescribe them to patients who have high blood pressure as preventive measure, as well as prescribing it to patients with high cholesterol. Another reason why Aspirin Dispersible tablets were dispensed in large amounts is that it can be used to treat a number of different symptoms that are common as most people suffer from them at some point in their life. The most prescribed item was the Salbutamol inhaler 100mcg in April 2014. It is used to treat breathing disorders, it relaxes muscles in the lungs and helps to keep the airways open, making it easier to breathe. It is used by adults, adolescents and children aged 4 to 11 years, as it is a good, reliable way to help those with either mild, moderate or severe asthma.There were 890,667 items dispensed of this medication.The high number of items of the Salbutamol Inhaler 100mcg is likely to be because asthma is a serious long-term condition that affected 1 in 12 adults and 1 in 11 children in 2014 in the UK according to Asthma UK. There were 1,167 deaths from asthma in the UK in 2011 and the use of the fast working Salbutamol Inhaler can reduce and prevent symptoms of asthma and so decrease the number of deaths caused by this condition. This again shows why the Salbutamol Inhaler was the most prescribed item in BNF Chapter 3. The most prescribed medication was Paracetamol tablets 500mg, which are used to treat pain including headaches, toothache, cold or flu symptoms and back or period pain. This item was prescribed a lot more than other items in this BNF Chapter as 1,551,769 items of it were dispensed in April 2014. This is evident when it is compared to the 676,756 items dispensed of the second most prescribed medication which was Citalopram Hydrobromide tablets 20mg.Citalopram Hydrobromide is a medicine that is used in depression and panic disorders. A reason why paracetamol may be dispensed so much is because the symptoms it treats are common to many people. The most prescribed medication in April 2014 was Amoxicillin Capsules 500mg at 548,282 items. It is a penicillin antibiotic that can be used to treat many different types of infection caused by bacteria, such as tonsillitis, bronchitis, pneumonia, gonorrhea, and infections of the ear, nose, throat and skin. The most prescribed medication was Metformin Hydrochloride tablets 500 mg, which are used in diabetes mellitus. There were 996,821 items of this dispensed in April 2014.It is used to control high blood sugar levels and helps the body to have the correct response to the insulin it produces.Therefore it is typically used by people who have type2 diabetes. The most prescribed item was Azathioprine tablets 500mg, which helps to suppress over activity in the immune system and helps to limit inflammation reducing pain and swelling. It is also used by people who have undergone organ transplants as it helps to reduce the chance of the body rejecting the new organ. There were 52,476 items of this medication dispensed in April 2014.This is closely followed by the second most prescribed item at 49,661 items dispensed of Tamoxifen Citrate tablets 20mg. Tamoxifen Citrate tablets are effective in the treatment of breast cancer in women and men that can spread to vital organs. This condition is life threatening, therefore tamoxifen Citrate tablets that can be effective in treating it were dispensed in large amounts. The most prescribed item in April 2014 was Folic Acid 5mg at 442,617 items. This is used to help produce and maintain new cells and prevent changes to DNA that could cause cancer. According to Cancer Research UK there were 331,487 new cases of cancer in the UK in 2011. This is a large number and it can be argued that in order to reduce the number of people who get cancer, there are large quantities of drugs dispensed that are useful in preventing cancer such as Folic Acid 5MG. Therefore explaining why it was the most prescribed item in BNF Chapter 9 in all the months I looked at. The most prescribed medication was Naproxen tablets 500mg at 307,772 items in April 2014. Naproxen is used to reduce hormones that cause inflammation and pain in the body. The most prescribed item in April 2014 was Latanoprost Eye Drops 500mcg at 182,354 items. This is used for conditions such as Ocular Hypertension and Glaucoma as it helps to lower pressure in the eye by increasing fluid drainage from the eye. The most prescribed item was Beclometasone Dipropionate, which is used to relieve symptoms of asthma and chronic obstructive pulmonary disease. There were 140,352 items of this medication dispensed in April 2014. The drug Mometasone Furoate Nasal Spray 5mg at 134,921 items closely followed this.This medication is a steroid used to treat nasal symptoms such as sneezing, and runny nose caused by allergies. It is likely that these two medications were dispensed in large amounts at this time because there is a lot of pollen in the air in April, leading to symptoms that these drugs treat . The most prescribed medication in April 2014 was Doublebase Gel at 143,002 items dispensed. It is used to moisturize skin by replacing lost water within the skin. Figure 3 shows that BNF Chapter 13 has the closest number of the items for the top two most prescribed items as the second most prescribed item Diprobase Cream was dispensed 142,806 times. This medication is used to treat eczema and other dry skin conditions. The most prescribed medication was Revaxis vaccine 0.5ml at 38,473 items in April 2014. Revaxis is used to protect against diphtheria, tetanus and polio.It is usually given to children from the age of six, teenagers and adults.The booster vaccine is typically given out at secondary school. The most prescribed item was Lido Hydrochloride Injection 1% 2ml, which is used as local anaesthetic used when performing operations. There were 19,954 items of this dispensed in April 2014. 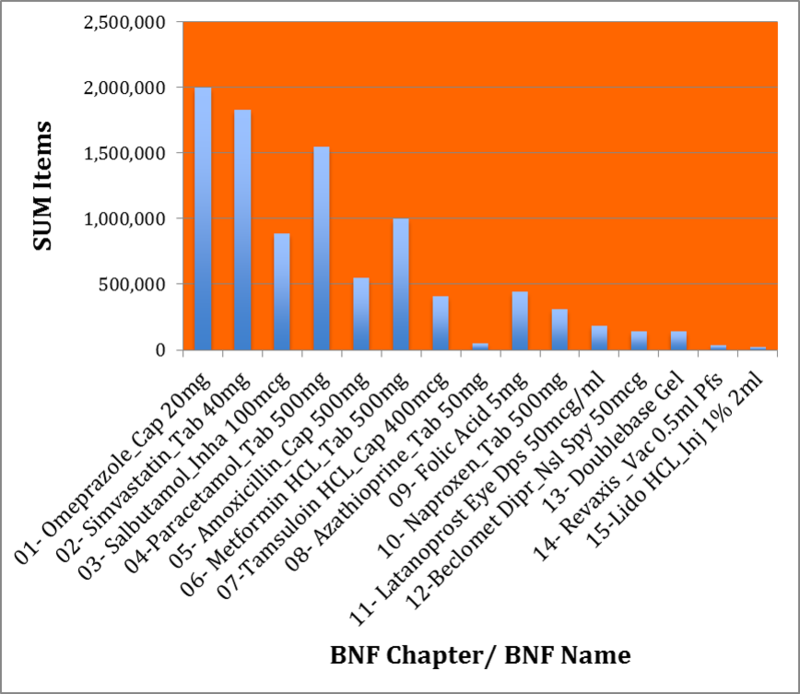 The final figure is the most prescribed items for each BNF Chapter in April 2014. It shows that out of all of the most prescribed items of all the BNF Chapters ,Omeprazole Capsule under BNF Chapter 1( Gastro-intestinal system) was dispensed in the largest amount, as there were 2,002,522 items of this medication dispensed.It also shows that one of the least dispensed medications when looking at the most prescribed items was Azathioprine tablets 500mg at 52,476 items. The BNF Chapter that had the smallest number of items dispensed was chapter 15( Anaesthesia). Overall I have not been surprised with the drugs that were the most prescribed for each BNF Chapter as they are drugs that treat long-term illnesses or symptoms that most people will experience in their life.This is apparent when looking at the most prescribed items for BNF Chapters 2,3,6,9,12 and 13 which treat or prevent long-term illnesses such as high cholesterol, asthma, diabetes and cancer.Whilst the most prescribed items for most of the other BNF Chapters are helpful with common symptoms that nearly everyone will experience in their lives such as sneezing,inflammation and pain in the body,headaches, toothache and different types of infection caused by bacteria. I now look forward to digging deeper into the GP Prescribing data to find out more new things such as whether there are seasonal variations in the medication that is prescribed and whether there are variations by location. Got a PDF you want to get data from? Try our easy web interface over at PDFTables.com!